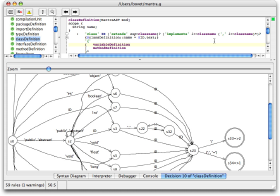 ANTLRWorks is a GUI development environment for building ANTLR v3 grammars. It is a stand-alone Java application that you can just click on to start using ANTLR. It contains all necessary jars and is the easiest way to get started using ANTLR. 1.5.1 is the latest stable release and contains ANTLR v3.5.1. On Mac OS X you can just click on that jar and it will start up the GUI. Same for Windows unless you use IE (IE thinks it's a zip so you'll have to rename it). On Linux, you have to save to the disk and run from the command line. That jar includes all the other jars necessary to run it including ANTLR 3.5.2, StringTemplate 4.0.8, and StringTemplate 3.2.1. Latest ANTLR version is 3.5.2, released March 25, 2014. v3 is written in ANTLR v3 and StringTemplate 4.0.8. Parsers that build template output still use StringTemplate v3 for backward compatibility. In antlr-3.5.2-complete.jar, you'll find everything you need to make ANTLR and its generated parsers work. Please see release info. Take your pick from download directory. ANTLR v3.1.x binaries for .NET framework. No dependence on the Java runtime. 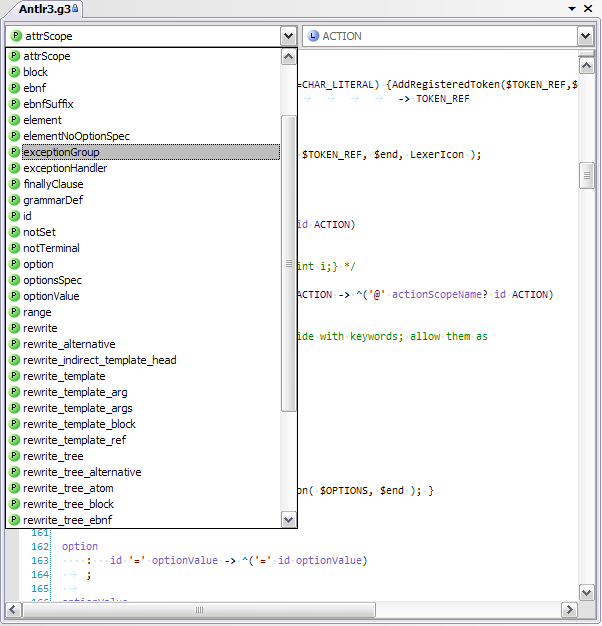 antlr3.exe and StringTemplate and ANTLR runtime libraries it depends on. Completely independent version written by Sam Harwell (ported from Java). Leon Su has created an awesome unit testing system for grammars called gUnit (included in main distribution as of 3.1 release). It provides a simple way to write and run automated tests for grammars in a manner similar to what jUnit does for unit testing. The basic idea is to come up with a bunch of input/output pairs for rules in a grammar. The input can be a single line or multiple lines of strings or even an external file. The output can be simply success or failure, an abstract syntax tree (AST), a rule return value, or some text output. gUnitEditor: Thanks to Shaoting Cai, we have a GUI for gUnit! You can download gUnitEditor here. 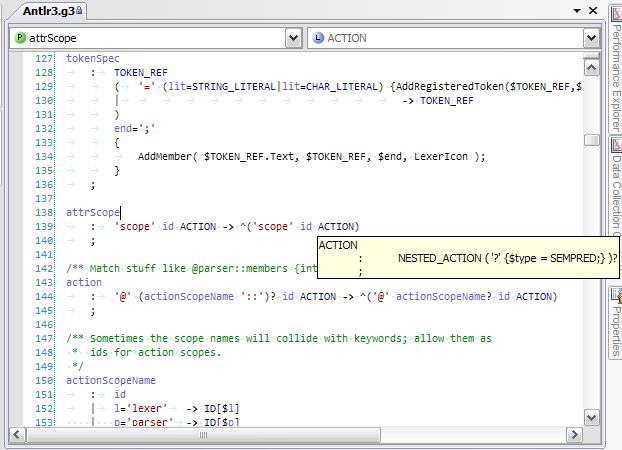 Edgar Espina (same name at gmail.com) has created a cool looking ANTLR v3 plugin for eclipse. 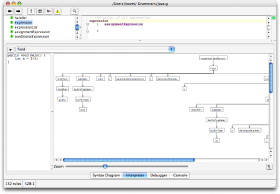 AntlrDT: Antlr v3.1 grammar and StringTemplate editors to the Eclipse platform. 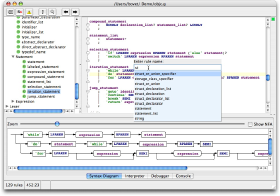 ANTLR Support for netbeans. Or, from the NetBeans repository. Sam Harwell's Visual Studio module for ANTLR. 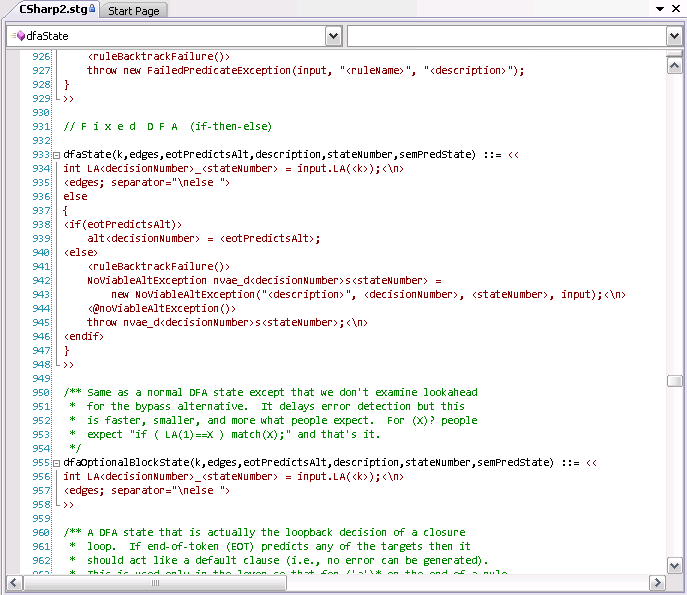 Also does StringTemplate syntax highlighting. ANTLR v3 sample grammars (C, C#, Java, ActionScript, and Python targets). Mantra Programming Language for a prototype (work in progress). Previous generation is ANTLR version 2.7.7 (released November 1, 2006). Here is an ANTLR v2 to v3 converter (in progress and only marginally useful; send me fixes!). ANTLR comes with complete source and is released under the BSD license. Terence Parr, the ANTLR project leader, is available for tech support. Please also join in the ANTLR discussions on the antlr-interest list.